I'm down to the last full week before I have to head back to work. It will be nice to be back into a regular routine, but I'm still not ready for summer to be over. This week will be devoted to spending our last few days at the pool while we can as well as finishing up any last minute tasks for school. 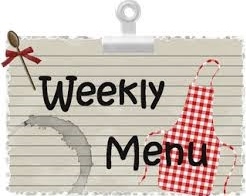 As far as our menu goes, I'm looking forward to trying out a couple new dishes this week. I've also been wanting to add some baked oatmeal to the freezer but my plan is to try tweaking my recipe a bit. I want to cut back on the sugar and make it a little healthier. I'll keep you updated on how that turns out! Smoothies- I've been having these almost every morning. Generally mine consist of almond milk, a large amount of spinach or kale, chia seeds, and frozen fruit.